A quarter-century ago, Jim Graham’s aunt pushed a small obituary across the table. His mother had just died, and he had started hearing the whispers, that the man who raised him was not his father. He asked a question of the brother and sister-in-law of the man whom he thought was his father. He received a chilly response. A persistent man, Graham asked more questions. He took that obituary, and his questions, and accumulated a stack of other old papers, each containing a scrap of evidence, or a puzzling clue. That stack and Graham’s pushing culminated Monday in a startling and potentially groundbreaking milestone to his story: the exhumation of a Catholic priest in a Tewksbury, Massachusetts cemetery to collect DNA for a paternity test. “I’m pretty persistent, and I wasn’t going to go away,” Graham said. Graham, 72, now living in South Carolina, has been piecing together these clues in order to extract official confirmation of something he said he knows in his heart: that Father Thomas Sullivan, born in Lowell, Massachusetts, was his biological father. Graham’s journey actually started during his childhood in the 1940’s. His parents, John and Helen Graham, divorced when he was a toddler. John Graham got custody of all three children, Jim Graham and his two sisters, and raised them in Buffalo, New York. They rarely saw their mother. "The only time I would see her would be four days during Easter and four days during the summer vacation, consecutive days,” Graham said. “And there were certain hours when she could see us. Ten in the morning until 7 o'clock at night. No overnights were allowed." John Graham was a gruff, barrel-chested man who ran a Texaco gas station. Jim Graham says the relationship between them was cold. “With me, he never supported me. He never said anything kind to me, never played ball with me," Graham recalled. “With me for some reason there was a—which I could never understand—a disdain." John Graham passed away in the late 1970s. Helen Graham died in the spring of 1993. The first whispers followed her death like phantoms. So in the fall of 1993 he visited his Uncle Otto and Aunt Katheryn Graham. It wasn’t a warm welcome. "Katheryn took this out, a newsletter from the Oblate newsletter, the obituary, and she slid it across the kitchen table and she said, 'This man may have been your father. We don't know. Only the principles know, and they're all dead.’"
Graham said he knew right away. The nose. The eyebrows. The eyes. “I realized that obviously this was my father," Graham said. The resemblance is significant. But that alone is not undeniable proof. But that bit pointed him to the first step on his path: An address in Tewksbury, and a writing credit on the obituary to a Father Thomas J. Reddy. Graham tracked down Father Reddy in Tewksbury. 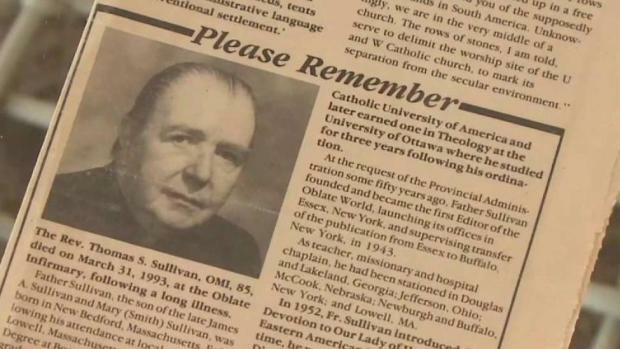 Father Sullivan had lived the out the last of his years at the Oblate Infirmary and Retirement Home, a church-affiliated nursing home on Chandler Street until he died in 1993. Sullivan was buried in the back. Reddy, now deceased, pointed Graham to the Immaculate Conception Church in Lowell. It was the home parish of the Sullivan family, where a young Tom Sullivan attended service before becoming a priest. Helen Graham fled Buffalo, taking her baby to New York City in the mid-1940s. She found work at the Polyclinic Hospital, living in the nurses' dormitory. But then Jim Graham ran into a locked door. Where was he, barely a toddler, while his mother worked in the hospital across the city? His mother's old address book held the key that opened that door. He found a number for a nun, and in 1996, he paid her a visit. "I said, 'Sister, can you at least tell me where I was? My mother was working in the hospital. Where was I? Who was caring for me?' And she said, 'Oh, you were in the orphanage. You were in the Foundling Hospital.'" Graham recalled. The Foundling Hospital still exists, although the orphanage wing was closed decades ago. The nuns there tended to the children, and they kept very detailed records. Jim Graham found his. Thirty-two pages, all typewritten. "It's 13-months of detailed interviews that the nuns took of my mother every week when she came to pick me up," Graham said. More clues in the information the nuns kept. In entries starting in January 1947, Helen Graham insisted she be known by her maiden name, O’Connell. Her husband, John Graham, was listed as Jim Graham’s step-parent. Jim Graham’s father was listed as unknown. An entry later that month reads, "It is our feeling that Mrs. Graham will eventually feel free enough to verbalize her difficulty, but at this time merely discussed her fears about finding herself in a large, strange city." Jim Graham concluded that his mother was not alone in that large, strange city in 1947. He believes that Father Thomas Sullivan, born and raised in Lowell, a graduate of Boston College, fled Buffalo with his girlfriend and son, fled the Church, and took exile in Hell’s Kitchen. "I understand that he was a bartender and a short-order cook. He was doing these kinds of things to survive in New York," Graham said of Sullivan. But the nuns may have unwittingly blown the whistle on the hiding family. They called the church in Buffalo to verify Jim Graham’s baptism. The next month, a visitor. In an entry from March 11, 1947, the nuns at the orphanage noted Helen had told them that “Father Larkin from Buffalo had paid her a visit and reported (her daughters) were doing very nicely and stated Father Larkin was confident everything will turn out right in the end." "Father Larkin, I found out was a friend, a good friend, of Father Sullivan,” Jim Graham said. “About 15-years older. From Lowell." Father Larkin returned the next month to visit Jim. Now at least one church official in Buffalo knew where Helen Graham. Then in May, Jim Graham came down with chicken pox. The nuns transferred him to Willard Parker Hospital, which specialized in treating infectious diseases. He stayed there for more than a month. But the hospital bean counters were curious to know who would pay the bill. After meeting with the Willard Parker employee weeks later, Helen Graham told the nuns she was terrified that Willard Parker would refer Jim’s case to a Buffalo hospital, and “that her husband would have to be contacted, and she just did not want that to happen." "She was nervous that the authorities from Buffalo were going to find us," Jim Graham said. "And they did." On July 23, Helen Graham told the nuns that "Willard Parker Hospital did contact Buffalo." Six days later, a warm summer night, a group of men arrived at 332 West 45th St. at 2 a.m.
One of them, a private detective, secured a key to apartment five on the third floor. Unannounced, the men walked into the apartment and found a couple in bed: Helen Graham and a man who was not her husband. The man was never named. Soon after, John Graham filed for divorce on the grounds of adultery. Those associates turned out to be private detectives. Called to the stand during the divorce hearing, John Graham and Otto Graham testified they saw Helen Graham getting out of the bed naked that hot July night in New York. They also testified to a naked man getting out of bed. But they only described him as “from Buffalo.” Neither Graham brother offered the man’s identity in court. And no one in court asked, according to the record. Graham doubts a gas station manager from Buffalo could afford an army of private detectives, and a pair of high-profile attorneys to work his divorce case. "I want the Church to be more forthright," Graham said. He wants more than confirmation of his paternity. In his mind, he already has that. He wants an admission from the church that they stole his real father from him and left him to live with a man who had no love or affection for him. "I think all those years, he was taking it out on me because I had to live with him,” Jim Graham said of John Graham. A businessman and a self-made millionaire, he doesn’t want money. He wants a confession from Catholic authorities that he is the son of a priest. So he tweets. He calls. He writes letters. And has picked up some allies, like Olan Horne. Horne read a pair of articles last August from The Boston Globe’s Spotlight reporter Michael Rezendes on the children of priests. "I was here in the house by myself. I read his story and I actually put my hand on my chest. It emotionally took a breath away from me," Horne said. Horne reached out to Graham and offered to help. As a boy, Horne was sexually abused by a Boston-area priest. He since became an advocate for victims and built a network of church contacts, including Cardinal Sean O’Malley, of the Boston Archdiocese. Horne set his sights on a meeting with O'Malley to plead Graham's case, and eventually landed that meeting at the Pastoral Center for the Boston Diocese. O’Malley agreed to call Father Louis Studer, leader of the U.S. provincial division of the Missionary Oblates of Mary Immaculate, a religious order of the church, in Washington, D.C.
"The truth is I don't need anybody to convince me that they haven't done the right thing,” Horne said. “And I'm not here to convince you that the Oblates are good or bad. I'm here to get Jim an answer to his question." But Studer said there are no records to back up Graham’s claim. Graham debated whether to push to have Father Thomas Sullivan’s remains, buried off Chandler Street in Tewksbury, exhumed to collect samples for a DNA test. Ultimately, he contacted a Boston attorney to take on the legal battle, to see if science will confirm what his investigation pointed to. And he knows that the answer could pave the way for countless others like him, children growing up with whispers and uncertainty and secrecy filling like smoke the place in the heart where a father should be, to get answers from the Church. "Obviously… there's thousands of stories like this. But I think it's time that the Church says, 'Yes, we did these kind of things.' And hopefully they'll do less of them." After all the years of fighting, the Church did agree to allow Graham to exhume Father Thomas Sullivan at his own expense. The date was set: Monday, June 18, 2018. The day after Father’s Day. The exhumation took over four hours. Graham brought forensic anthropologist Anna Marie Mires to gather the samples. The metal casket had to be sawed open, Mires said, because the lock was frozen. But when the casket opened, the body was in good shape for DNA testing. Dr. Mires took four samples of what she described as "well preserved" for DNA comparison. “One of the most reliable samples is to take a midsection of the femur bone. I was happy to see the marrow cavity was still intact. It was red muscle which is all good news,” Mires said. Graham AND Mires took the samples directly to FedEx. He expects results back from the lab in about a month. During the exhumation as Graham sat on a bench, he held onto a crucifix Sullivan wore for nearly six decades. Graham said he keeps it because it makes him feel close to Sullivan. “This was bouncing off his chest all those years,” he said. A priest prayed with him at Sullivan’s graveside. Graham was uncertain when asked about what’s next, after a quarter-century of puzzling and sleuthing and pushing and asking. But it feels different now, and he remembers the moment it all changed for him. “It was when Dr. Mires came down the walk here. I was on the park bench, and she said, ‘It’s him,’” Graham said. And returning to the grave the next day, seeing for the first time the disheveled dirt unearthed, brought him some clarity. “I came here years ago and his tombstone was the same height as the others. Here we are the day after and his tombstone is 3 to 4 inches higher,” he said. Jim Graham had never heard that before.